This past weekend, the world watched in happiness, awe, and excitement as Prince Henry married Meghan Markle. Now this was not a normal union for a royal blueblood. For one thing, Meghan is divorced. Meaning she's had a husband and the "perceived" notion of her being a virgin is long gone out the door. Many men felt that her divorced status made her unfit to be the wife of a prince. Plus, she's several years older than Prince Harry. It's a marriage that's far out of tradition. Second, Meghan is mixed. Her mom is a copper-skinned sista with beautiful shoulder-length locs, and a sparkling gold nosering. Seeing her nosering brought back nostalgic memories of my neo-soul days when I wore a bejeweled nosering during my college days. So for us to have representation and inclusion in the royal family was something that many people never even considered. But the day has come. Third, Meghan is American, not British. I'm certain that no one expected Prince Harry to marry a foreigner and share the crown with her. Last, Prince Harry met Meghan on a blind date. You hear me? A. blind. date. Can you put yourself in her shoes? Who would have ever thought?! 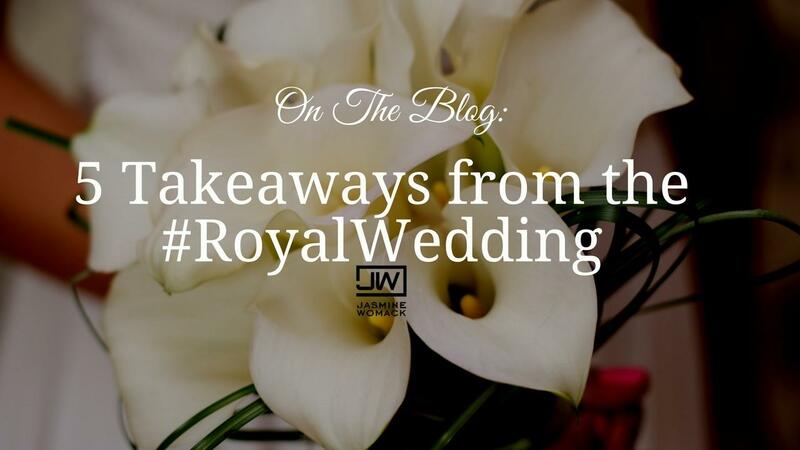 Now, while I wasn't gushing with joy or up at all hours of the night watching the wedding on t.v., I did jot down the following takeaways from their experience. 1. Take the limits off God. What's for you is for you. It doesn't matter your age or your shoe size (cue Prince, pun intended). Lol, just joking, but seriously, some of us limit ourselves based on our age or our past. We think that we won't qualify for certain things we want in life. Maybe you're trying to build a business and you have the experience in a certain field, but you are doubting yourself because you never studied business. Or maybe you want a successful relationship, but you have several children or you have passed a certain age and you've been listening to people say you have too much baggage. Listen. Take the limits off God. What's for you is for you. You just need to make sure you are prepared to receive it when it comes. Whatever your goal is, make sure that you are in constant preparation mode. Meaning, that you are working daily on being the best version of you, and that you are constantly feeding your mind, taking care of your body and finances, and cultivating your spirit. Success comes when opportunity meets preparation. Meghan was open, willing, and prepared to be in a relationship, which is why she agreed to the blind date in the first place. 3. Assess your circle. Relationships are everything. Prince Harry and Meghan were set up on a blind date through a mutual friend. This means that Meghan has a rich circle of relationships and friendships, some of whom have powerful connections. You never know WHO people know. Who you surround yourself with will indicate where you will be in the next several years. Cultivate relationships with people who add to you, and you to them. Eliminate people who are draining and who keep up mess and drama. Meghan's African-American heritage was unapologetically displayed throughout their wedding ceremony. From the young Cellist, Sheku Kanneh-Mason, to the southern-baptist choir, to the preacher, Meghan shared her heritage and roots with the world. Although some of the music, preaching style, and overall diversity is not something we see on a regular basis when it comes to the royal family, Meghan stayed true to herself and didn't allow anyone (or their opinions) to make her change. How does this apply to you? Be true to yourself and who you are. Stop looking on the 'gram and allowing other people's pictures to make you feel like you have to keep up with the Joneses. Stop thinking you have to look and sound a certain way to reach a certain level of success. Newsflash: You don't. Be you. And your family, friends, and tribe will love you just the way you are. 5. Be intentional with your online blueprint. Media outlets have been picking up old snippets of Meghan from when she was a child, and when she was on a TV show several years ago. When people look at your digital blueprint, your internet history, what will they find? Clean your profiles up and make sure that you are presenting a respectful version of yourself and your brand always. Did you watch the #RoyalWedding? If so, what were some of your takeaways? Comment below. I'd love to read your thoughts! Make sure you're following me on Facebook! Click HERE.